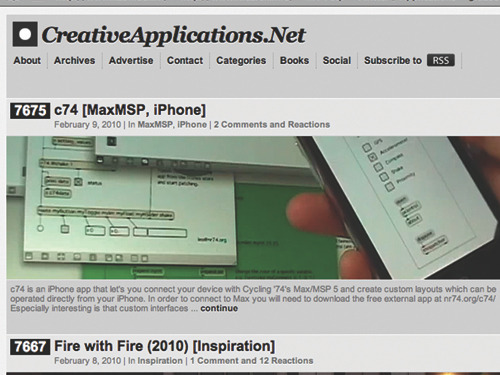 c74 is an iPhone / iPod Touch app that let's you connect your device with Cycling '74's Max/MSP 5/6. The massive improvement over existing interface layout apps is that the layout is dynamically controlled by Max. Therefore we can have the interface adapt to the tasks it has to perform in real-time. Custom controller interfaces are built straight from within Max, presets can be stored etc. The external features some nice attributes for receiving accelerometer, GPS, compass, shake gesture and proximity data. - Deleting/closing the c74 external now disconnects the iOS app properly. - iPad now works properly in landscape mode (beyond 720px). - [read filepath] message now works correctly. - Fonts and colors are now stored within presets. - button object now returns [ID 1] or [ID 0] instead of [ID bang].